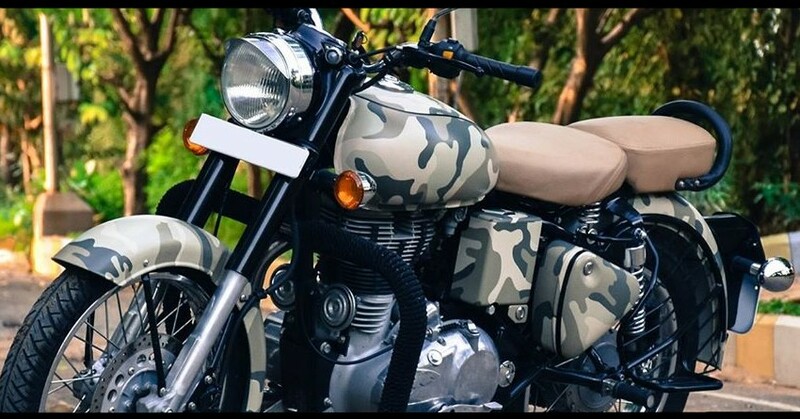 RE Classic Camouflage Wrap by SV Stickers: Love for motorcycling in India gets suddenly divided when someone is asked about his/her preference for Royal Enfield. Either people love it and consider all other bikes non-existent or people don’t consider Royal Enfield in their league of champions. The fight may never end as Royal Enfield is in no mood of entering a lower segment of motorcycles anytime soon. 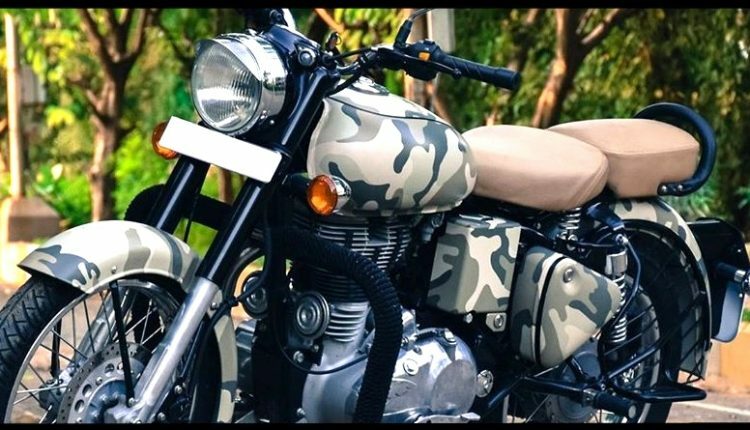 When we consider Royal Enfield fans, they have grown a lot in number and now demand much more than just Black painted Bullet to fulfill their love for open roads. In such circumstances, RE introduced the Redditch Edition and few other bright shades on its bestseller Classic 350. SV Stickers thought of taking this journey further with an all-new camouflaged pattern instead of the regular paint job. 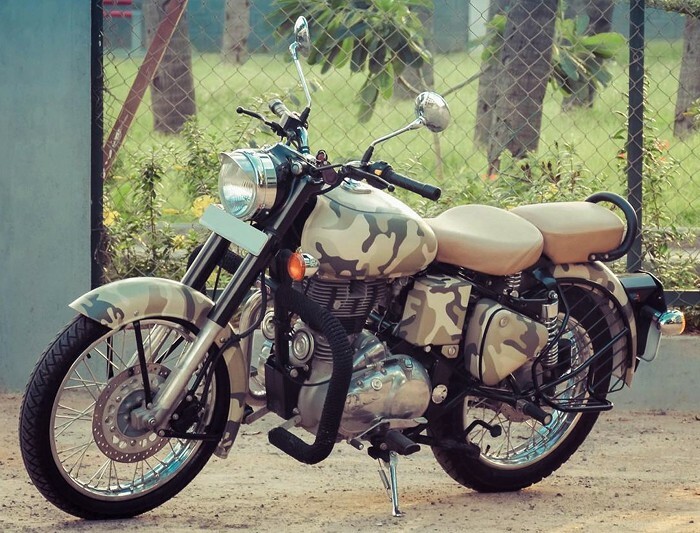 They kept each and every component in its stock condition as the character of Royal Enfield Classic was very important for this wrap job. Every metal part was removed and then carefully wrapped in this Desert Storm inspired base shade. Rugged character was added through nylon rope on the crash guard while seats here are finished in medium tan shade for premium feel over the standard black finish. Suspension cover at front and side guard from rear were left Black for classic highlights on the motorcycle. Royal Enfield Classic 350 is powered by a 346cc, single cylinder air cooled engine producing 20 HP at 5250 rpm and 28 Nm at 4000 rpm. The engine comes mated to 5-speed gearbox and claims real world mileage figure of around 40 kmpl. It weighs 192 kg, making it a lot more heavier than any other motorcycle around its segment. The 13.5 liter fuel tank is perfect for a motorcycle of its class. 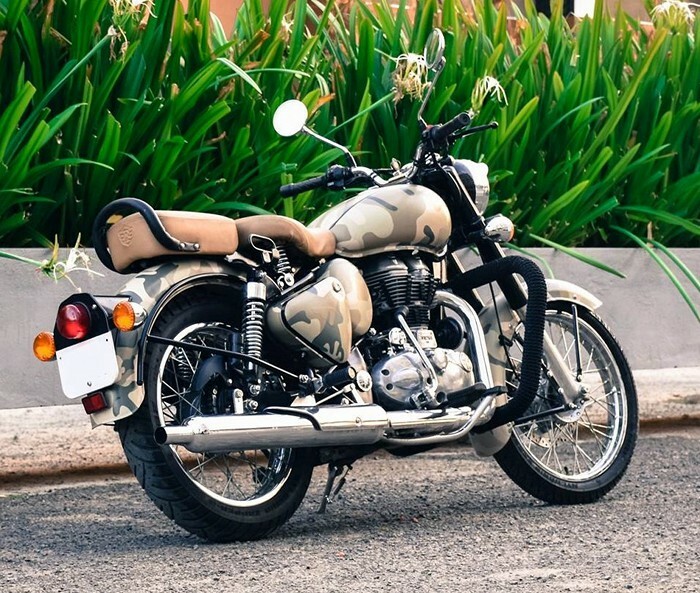 Royal Enfield use spoke wheels to keep the vintage character alive on Classic 350 while advanced features like electric start, disc brake and gas charged shocks help riders get much more comfort than one used to get from old generation of RE bikes.